I have finally finished the 2nd sock to the pair I started back in *&$$# ...... we won't say when *giggle* This pair was knit toe-up. This pair was made with Tofutsies. 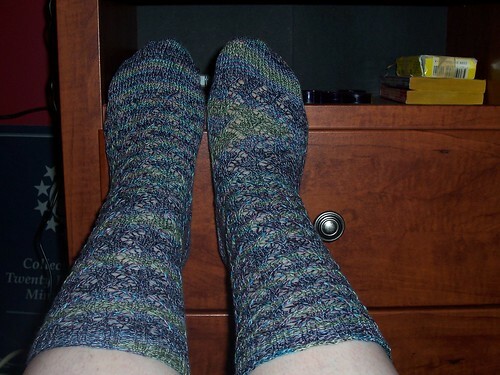 Pattern is Crosshatch Lace from More Sensational Knitted Socks. I have to say wearing handknitted socks feels very different then regular socks. I feel like I can feel every stitch on the balls of my feet. So weird. But my socks are still a bit loser than I would like. How many pairs will I have to knit before I really get the hang of knitting the "just right" size for my feet? ?